Click here to download latest version of Adobe Acrobat. For those who can and wish to support the activities of the Saint Louis Second Wind Lung Transplant Association, a stakeholder membership category is available for a minimum $25.00 annual donation, due in January of each year. New members may join at any time. We hold an IRS 501(c)(3) tax designation, these donations may become eligible for deduction on the Federal tax return. People join Second Wind for a variety of reasons: They have been told they need a lung transplant. They are listed and waiting for a lung transplant. They have had a transplant. They have had a family member who has had or needed a lung transplant. They are interested in learning about and promoting organ and tissue donation and transplantation. • Receive the Second Wind St. Louis newsletter. • Have voting privileges at all Business Meetings. • Are eligible to hold an office in the association. • Receive E-mail updates on breaking transplant news. Receive information on local education and awareness events. Are involved in education and donor awareness efforts. 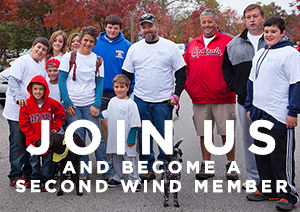 • Receive recognition as a Second Wind St. Louis Member in all public information and materials. Although we meet in St. Louis, we have members from many areas around the county. Donation: $25.00 per year and is tax deductible. We need your participation and your support. No one can know the impact of the transplant experience like someone who has been through it. We believe we can make a difference in your transplant experience. We are a chapter of the national organization, Second Wind Lung Transplant Association, Inc., which has several other chapters across the country.